Today President Sylvia M. Burwell announced that American University has achieved carbon neutrality, which means it has a net zero carbon footprint. AU publicly pledged to become carbon neutral by 2020 back in 2010. Now because of the commitment, leadership, and innovative strategic planning of its staff, faculty, and students, AU has reached its goal two years early. AU becomes not only the first carbon neutral university in the nation, but it is also the first urban campus and the first research university to accomplish this important achievement. AU has met the guidelines set by Second Nature, a nonprofit dedicated to accelerating climate action in and through higher education, to become a carbon neutral university. "Our community joined together to accomplish this important goal established in 2010," said President Burwell. "We wanted to demonstrate leadership and innovation in addressing the serious social, economic, and environmental issues associated with global warming. Having a net zero carbon footprint reflects our commitment to acting on our values and leading into the future." Concerns about the increasing pace and intensity of global climate change and the potential for unprecedented harmful effects on our world, are important to the AU community and has led to the university's continued action and leadership in this effort. President Burwell further solidified that commitment when she signed the "We Are Still In" pledge to work towards the goals of the Paris Climate Accord. "As the first university to achieve carbon neutrality, and achieving it two years ahead of schedule, American University is truly raising the bar for the country," said Timothy Carter, president of Second Nature. "With this type of leadership and innovation, we can meet our shared climate goals faster than anyone expects." AU's innovative approach to reducing emissions, using green power and purchasing strategic offsets helped it meet its commitment to neutrality two years early. The university concentrated on measures that directly impact its own footprint. AU works to reduce energy use per square foot and produce renewable energy on campus and within its electricity grid. The university purchases renewable energy and offsets to balance the greenhouse gas emissions it produces. Fifty percent of AU's electricity comes from solar power sources. AU hopes to be a model for other institutions looking to drive down their carbon footprints and become carbon neutral. Looking ahead, AU plans to do more. Currently, the university is undergoing a massive two-year hot water and heat conversion project that will drive down campus use of fossil fuels. Current underground steam lines will be replaced with low temperature hot water lines to serve the university's heating needs. This new system will provide American University with reliable energy and carbon savings for the future. In 2010, AU wrote its first Climate Action Plan and committed to carbon neutrality by 2020. In April of 2016, AU became a charter signatory to the Climate Commitment through the nonprofit Second Nature. It was this pledge that added resiliency to the university's existing pledge to become carbon neutral by the year 2020 and further expanded upon its pledge to increase its sustainability efforts and education. One year later, in April of 2017, the university committed to working toward the goals of the Paris Climate Accord by signing the "We Are Still In" pledge. 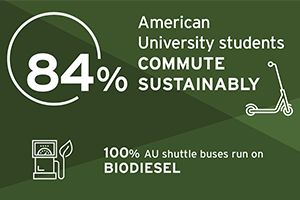 AU's carbon neutral campus is the result of a campus-wide community effort which was led by strategic planning efforts of the Office of Sustainability and students, faculty, staff and significant contributions from offices such as Facilities Management and Transportation. AU strategically approached the goal of carbon neutrality by driving down greenhouse gas (GHG) emissions wherever possible, then using renewables and finally purchasing offsets that align with the source of emissions. Students came together at zero waste events, joined in campus-wide competitions to reduce waste and AU's carbon footprint, and became ambassadors for sustainability. Faculty integrated sustainability into their classes - not just through their research and what they teach, but how they teach. For example, students taking an environmental studies course organized a Waste Audit on Campus and an Urban Ecosystem walk on and around campus to collect data on their local environment (light pollution, animals, birds, trash). Other students produced short films about AU waste practices and campus waste infrastructure. AU Scholars prepared a Sustainability City design project. "Climate change is one of the most urgent issues of our time," said Megan Litke, AU director of sustainability programs. Each organization and individual has a responsibility to act to reduce their environmental impact. I'm proud to be a part of a university that takes this responsibility seriously and has acted to achieve carbon neutrality." "Sustainability is something that our students care deeply about. But more than talking about it, we have to model the behavior we want to see in the world around us," said Kiho Kim, environmental science professor at AU. "Achieving carbon neutrality is a very strong statement about what is important to us, the entire AU community, and shows that we will continue to lead by example." 50 percent of AU's electricity comes from 250,000 solar panels at a solar farm in North Carolina. This site was the largest solar purchase/installation by a non-utility company when it was constructed in 2014. 8 Green Roofs - More than any other university in D.C. Efficient cookstoves in Kenya, in partnership with The Paradigm Project, offset study abroad air travel and decrease deforestation, which is a major contributor to climate change. They also improve indoor air quality. Planting trees in D.C. helps offset GHG emissions from commuting, and helps the District move toward its tree canopy goals. Homeowners also benefit from onsite stormwater management.